Fermilab's particle accelerators help drive discovery in fundamental physics, innovations in accelerator science and advances in accelerator-based applications. Its main accelerator complex comprises four particle accelerators and storage rings — the Linac, Booster, Recycler and Main Injector — the last of which produces the world's most powerful high-energy neutrino beam and provides proton beams for various experiments and R&D programs. The accelerator complex will become even more powerful with the upcoming PIP-II project, an essential upgrade of the accelerator complex. PIP-II will become the new heart of the complex, enabling it to generate an unprecedented stream of neutrinos for the international, Fermilab-hosted Deep Underground Neutrino Experiment (DUNE) and Long-Baseline Neutrino Facility (LBNF). 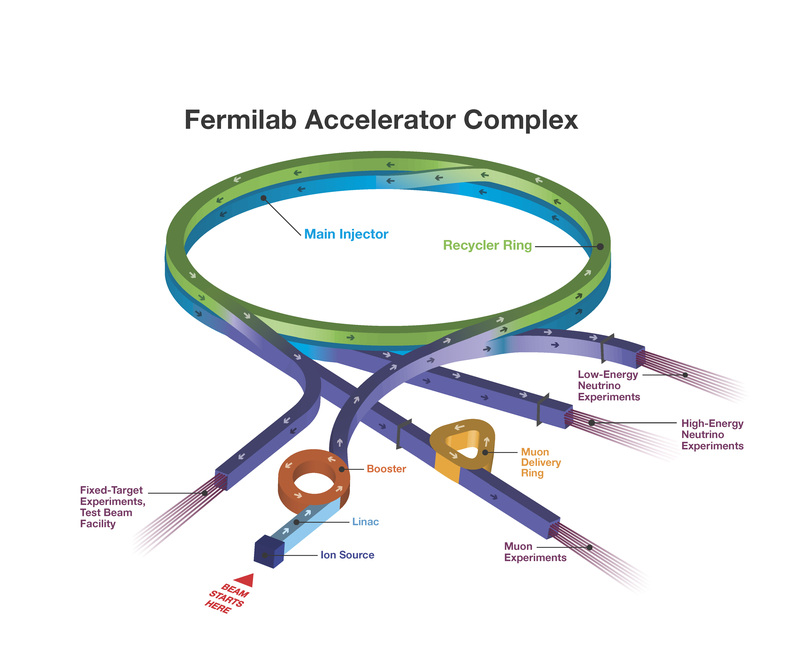 Fermilab's accelerators and how they fit into the laboratory's accelerator complex are described below. The PIP-II project, an essential upgrade of the lab's particle accelerator complex, includes the construction of a 215-meter-long linear particle accelerator. The capability and flexibility that is built into the PIP-II design will allow multiple simultaueous experiments for many decades to come. Fermilab's linear accelerator, better known as the Linac, is a roughly 500-foot straight accelerator that brings proton beams up to energies of about 400 MeV, providing proton beam for the Booster accelerator and the rest of the chain of accelerators. Proton beams enter the Fermilab Booster from the Linac, accelerating through its approximately 1,500-foot-circumference ring to an energy of 8 GeV. The Booster provides low-energy neutrino beam for the MicroBooNE experiment, as well as the Muon g-2 and Mu2e experiments. It also provides beam to the Recycler. The Recycler is a kind of staging area for proton beams after they exit the Booster. Once beam enters the Recycler, a 2-mile-circumference ring, it is "slip stacked" — combined into batches of protons to form a more intense beam. Once that is done, the proton beam enters the Main Injector, on top of which the Recycler sits. The Recycler also provides beams of particles called muons for Muon g-2 and, in a few years, for the Mu2e experiment. The Main Injector, situated directly beneath the Recycler in the same tunnel and two miles around, ramps up proton beam from the Recycler from 8 GeV to 120 GeV. The world's highest-intensity neutrino beams are generated from these proton beams. The Main Injector provides neutrino beams for the NOvA experiment, as well as the upcoming Long-Baseline Neutrino Facility and Deep Underground Neutrino Experiment. Some of the proton beam from the Booster will be used to produce pions in a specially designed target system. For the Muon g-2 and Mu2e experiments, these pions will then decay into particles called muons. The parent protons circulate through the 500-meter-circumference Muon Delivery Ring. The Muon Delivery Ring delivers these muons into a muon storage ring for further study. After protons circulating through the Muon Delivery Ring (above) decay into muons, the muons are routed into the storage ring for the Muon g-2 experiment. The 50-meter-circumference electromagnet arrived at Fermilab from Brookhaven National Laboratory in 2013. Scientists study the muons in the ring to take a precise measurement of their precession rate, which can tell us about particles popping in and out of the vacuum of space-time. The Fermilab Accelerator Science and Technology (FAST) facility is America's only test bed for cutting-edge particle beams and for accelerator research aimed at intensity frontier proton accelerators. Electrons are accelerated through a 125-meter linear accelerator, called the electron injector, to an energy of 150 million electronvolts before heading into the Integrable Optics Test Accelerator. The 40-meter-circumference Integrable Optics Test Accelerator, known as IOTA, at the Fermilab Accelerator Science and Technology facility accelerates electrons from the FAST electron injector. Scientists use IOTA to test new accelerator technologies and the physics of beams. The Accelerator Application Development and Demonstration (A2D2) compact accelerator at Fermilab's Illinois Accelerator Research Center enables the exploration of industrial applications for compact linear accelerators and electron beams. A2D2 is also a stepping stone that can inform the design of future compact accelerators, which are cheaper and more practical to build in an industrial setting.